North Coast Medical is headed to New Orleans, Louisiana for the 2019 AOTA Annual Conference, April 4 – 7. We are excited to introduce the Progress™ Ultra-Ortho™ to all the Occupational Therapists, and look forward to meeting all attendees! 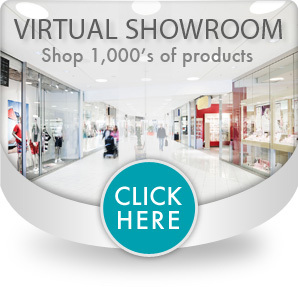 Visit us at booths 1420 & 1421 to see each of the following products and more. We’re beyond excited to introduce the Progress™ Ultra-Ortho™, a multipurpose orthotic that provides appropriate wrist positioning and adjustability for both flexion and extension of the hand, wrist, thumb and digits. The orthotic is biomechanically designed to immobilize and offer adjustable support to meet a variety of therapeutic goals. 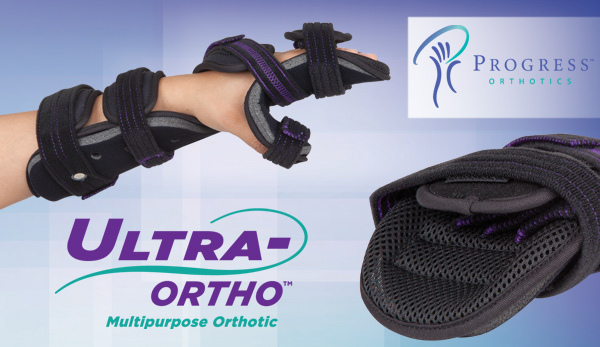 The Ultra-Ortho™ allows Metacarpophalangeal (MCP) joints to be placed in an extension for extensor tendon injuries or flexion for joint injuries. The thumb is placed in a good sweeping position for adjustable abduction, extension and flexion. The orthotic is easily adjustable and does not cause any impingement or pressure areas when straps are fastened. This allows the orthotic to be used immediately for a variety of different types of pathologies maximizing the functional outcome and progress as needed without refitting for a new orthotic. Go ahead, bend some perfectly good utensils! Good Grips® stainless steel utensils feature a 1-3/8″ (3.5cm) built-up handle. The soft, latex-free material has flexible ribbing that adapts to any grip. The forks and spoons have a special twist built into the metal shaft that allows them to be bent to any angle, for either left or right-handed use. 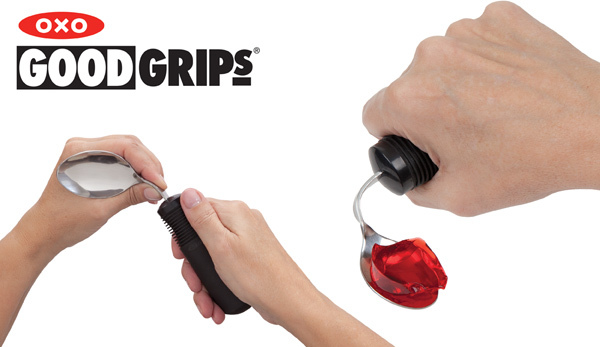 Cushioned grip keeps the utensil in the hand–even when wet. 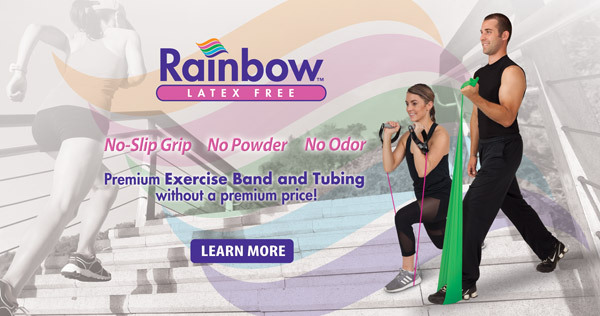 Finally, A Premium Latex Free Exercise Band with functional colors, without a premium price! Rainbow Exercise Bands make use of color-coded resistance levels with functional colors. Stop by the North Coast booth to demo all the color levels! The Comfort Cool® Ulnar Booster™ wrist splint provides biomechanical counter forces to the ulnar carpus while depressing the ulnar styloid in order to help realign and stabilize the carpal bones. This lightweight, unique splint helps restrict painful wrist motion while still allowing functional hand use. MuscleAidTape™ utilizes the latest sports medicine taping technology to provide drug-free muscle and joint pain relief. It provides strong support while increasing blood circulation to facilitate rapid healing. Stop by the North Coast Medical booth for a free taping! Everyone who plays wins instantly! 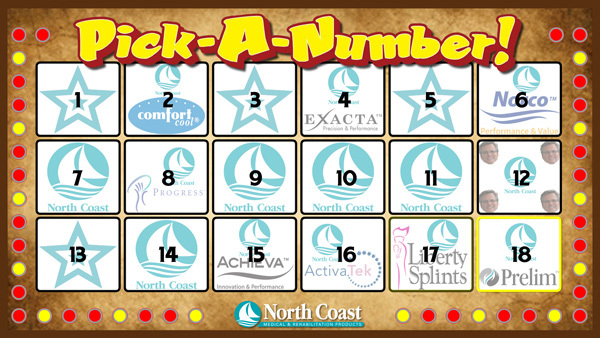 When you play our famous Pick-a-Number game you automatically get entered into our grand prize raffle. On April 6th at precisely 12:30pm you have the chance to win our $500 dollar grand prize! You must be there to win. We look forward to greeting you in the great city of New Orleans! Sincere appreciation to the following sponsors for their support at the AOTA Annual Conference!